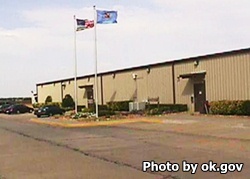 Charles E. "Bill" Johnson Correctional Center is located in Alva Oklahoma that incarcerates males. It is a minimum security prison that emphasizes substance abuse treatment. Inmates here have been convicted of felony drug offenses and are assigned to the Regimented Treatment Program or the Delayed Sentence Program. Additionally, inmates at this facility can participate in the Therapeutic Community program and a re-entry program for offenders who are nearing the completion of their sentence. Inmates at Charles E. "Bill" Johnson Correctional Center who did not complete high school or have a diploma are required to attend adult basic education courses and may earn a GED. Inmates can also receive medical care and mental health services while incarcerated. Two immediate family members can visit an inmate without a background check during the first thirty days of the offenders incarceration. The visit will be non-contact and the inmate must inform you of the date and time you can have this visit. All visitors must submit a visitation request form. It can take approximately 8 weeks for the visitation form to be processed.